West Indies 6-228 (Marlon Samuels 126, Kieran Powell 47, Mashrafe Mortaza 2-34) beat Bangladesh 227 (Mahmudullah 52, Mushfiqur Rahim 38, Sunil Narine 4-37) by four wickets. A timely match winning knock of 126 by Marlon Samuels supported by four wickets from Sunil Narine put West Indies on top in an interesting match vs. Bangladesh. Bangladesh scored 227 runs while batting first before their innings was squeezed with five balls to spare from the allocated 50 overs. West Indies achieved the target by smashing 228 runs for the loss of six wickets in 47 overs. 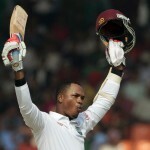 Marlon Samuels (West Indies) was declared ‘Player of the match’ for his magnificent innings. The third One Day International of the five match series was held at Shere Bangla National Stadium, Mirpur, on Wednesday, December 5, 2012. Earlier, Darren Sammy, the captain of West Indies, won the toss, he preferred to chase and offered the batting to Bangladesh. Tamim Iqbal opened the innings along with Anamul Haque and they scored just scored 18 runs in the first six overs. Tamim Iqbal hit 2 consecutive fours in the next over. Anamul Haque hit a couple of fours in the following overs and the pair gathered 11 runs in the 12th over with 1 six and 1 four. Sunil Narine struck twice and got rid of Tamim Iqbal for 22 and the incoming batsman Naeem Islam at four runs in the 13th over. The deadly spin bowling of Sunil Narine continued in his next over when Anamul Haque was declared leg before wicket for 33 runs with 1 six and 3 fours. Nasir Hossain became the next victim for just four runs and the Bengal Tigers were in a tight situation at 4-78 in 17.1 overs. The skipper of Bangladesh, Mushfiqur Rahim and Mominul Haque got together as the latter added 2 fours in the 20th over and the first hundred of the innings was displayed on the screen in the next over. Mominul Haq lost his wicket for 12 runs as Mahmudullah joined in with Mushfiqur Rahim. Mahmudullah opted to attack by getting 12 runs in the 30th over with 1 six and 1 four as Mushfiqur Rahim kept on creeping from the other end. The sixth wicket associated 58 runs when Mushfiqur Rahim was caught by Darren Sammy at point off Veerasammy Permaul for 38 runs. The home side was seven wickets down three runs later as Sohag Gazi took guards at the crease. The pace of scoring speeded up a little bit as Mahmudullah completed his seventh ODI fifty in the 45th over. He was gone in the next over for 52 off 70 deliveries with 1 six and 3 fours as Sohag Gazi contributed 30 runs from 36 with 5 fours. Bangladesh was bowled out for 227 runs in 49.1 overs. Sunil Narine was the most destructive bowler with four wickets, Darren Sammy and Veerasammy Permaul shared two wickets each whereas Chris Gayle and Dwayne Smith claimed one each. The dismal form of Chris Gayle continued when he was caught behind smartly by Mushfiqur Rahim off Mashrafe Mortaza for four mere runs. The first wicket was lost at 15 runs on the last ball of the fourth over as Marlon Samuels joined in with Kieran Powell. Samuels started off with his brave style, he hit 4 fours until the eighth over and was the most aggressive of the two batsmen. Powell secured his end while crawling as Samuels punched his 23rd ODI half century in the 17th over off 53 balls with 9 fours. The first hundred of the Windies innings was dispatched in the 21st over and the tempo of the scoring got enhanced by the two batsmen. The duo lifted the score to 126 in 26.3 overs when Kieran Powell was caught behind by Mushfiqur Rahim off Mahmudullah for 47 off 59 balls with 1 six and 4 fours. Samuels took over as the wickets kept on sliding from the other end while providing adequate partnerships. He was dropped on the fourth ball of the 42nd over by Mashrafe Mortaza off Mominul Haque at 96 runs. Marlon Samuels thrashed his century on the fifth delivery of the 44th over and humiliated Rubel Hossain for 24 runs three overs later with 2 lofty sixes and 3 fours. The target became easier for the Caribbeans since they required just 10 runs in the last 30 balls. Marlon Samuels was finally caught by Mahmudullah at square leg off Mashrafe Mortaza for 126 scored from 149 deliveries with 2 huge sixes and 17 fours. West Indies hammered 228 runs with four wickets in hand and 18 balls to spare. Masharafe Mortaza and Abdur Razzak were the top wicket takers with two wickets each whereas Mahmudullah and Naeem Islam held one wicket each. West Indies won the match by four wickets and bounced back in the five match series which Bangladesh already leads by 2-1.